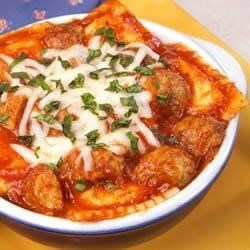 "Meatballs and cheese ravioli in a rich tomato sauce under a layer of creamy mozzarella cheese." Preheat oven to 350 degrees F. Cook ravioli according to package directions. Meanwhile, combine pasta sauce and meatball pieces in medium saucepan; cook over medium heat 8 minutes, or until heated through, stirring occasionally. Spray 13x9-inch baking dish with cooking spray. Drain ravioli; spread onto bottom of prepared dish. Top with the spaghetti sauce mixture; sprinkle with cheese. Cover with aluminum foil. Bake 20 minutes, or until ravioli mixture is heated through and cheese is melted. Garnish with basil, if desired. This could be the fastest, easiest chicken Parmesan you’ll ever make. Very Good...Everyone loved it!!! I would definitely make it again...I used large stuffed cheese shells instead..